The MA-2’s display is 30% larger than that of the previous model, drastically improving the visibility. Within the display, a digital needle moves between left and right, providing a visual indication of the beat in additional to the audible indication. A triangular icon shows the beat position and the timing at which the measure changes. The MA-2 is equipped with a newly designed electronic buzzer. It’s more powerful, providing easily audible sound that won’t be buried by high-volume instruments or high frequencies. You can choose from three different methods of setting the tempo: pendulum step lets you specify a numeric value just as on a mechanical metronome, full step lets you specify the tempo in one-step increments, and tap tempo lets you specify the tempo by pressing a button in time with the song you’re playing. You can also combine a time signature of between 0–9 beats with eight types of rhythm, supporting many types of musical practicing. The MA-2 provides basic metronome function, but also includes a “timer mode” and a “sound out mode” that are useful for daily practicing. Use the MODE button to switch between these at a touch. When the specified time elapses, an alarm sounds and the metronome stops. You can set this in one-minute increments between one minute and 120 minutes, making it ideal for warming up or practicing the basics. A reference tone is emitted from the built-in speaker as a guide for tuning. You can select the reference tone in the one-octave range of C4–B4. 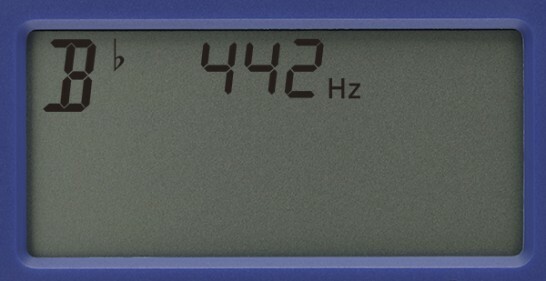 The reference frequency of A4 (calibration) can be adjusted in 1 Hz increments in the range of 410 Hz to 480 Hz. The folding stand lets the metronome stand on its own in an easily visible location. 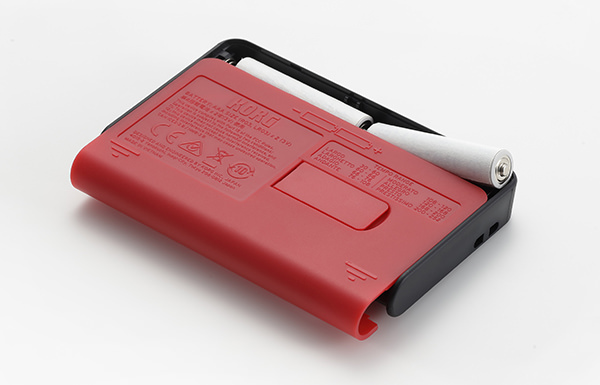 The sliding battery cover is designed as one piece with the main unit, so there’s no danger of the cover being lost when you replace the batteries. Quarter notes, eighth notes, triplets (straight triplets, triplets with inner beat omitted, triplets with the third beat omitted), sixteenth notes (quadruplets, quadruplets with middle beats omitted, quadruplets with the third and fourth beats omitted). 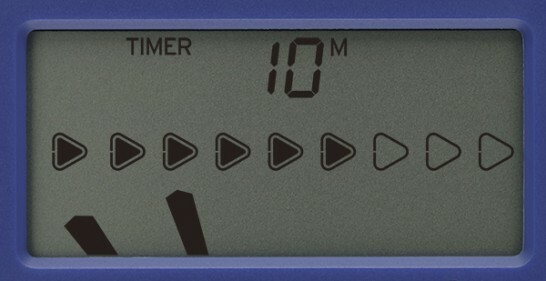 Settings for the metronome section’s tempo, beat and rhythm, and for the sound out mode’s calibration and reference tone settings, are remembered even when the power is turned off. However, these settings return to the initial values when you replace the batteries. 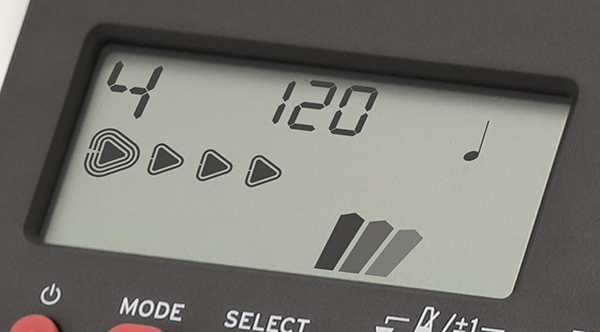 The Auto Power-Off function automatically turns the power off when 20 minutes have elapsed with the metronome stopped.